Sont 20 -Welle decorative style curtain rod set for living room ideas, double rod. Stylish set made of stainless steel Sont 20 -Welle, double-rail. 2-rail stylish set made of stainless steel V2A, with stainless steel tube Ø 20 mm, bracket system Sont 20, finial Welle. Decoration with loops. Bracket system and mounting system Sont 20, 2-rail. Mounting system Sont 20, 2-rail. Stylish set for living idea, Sont 20 - Welle, double-rail. Living idea by Stahldeko: stylish set Ø 20 mm made of stainless steel with bracket system Sont 20 and finials Welle 20, as 2-rail set. With this deco-article you can easily make curtain decoration on the floor and then mount the completely decorated rod on the brackets. Curtain decoration without rings and hooks - looped curtain are decorated directly on the rod. Extension for bracket system Sont-20, stainless steel V2A. Stylish set Sont 20 - Welle, double-rail, with stainless steel ring. 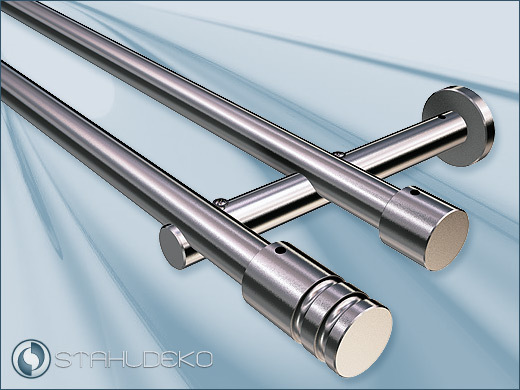 Stainless steel drapery rod Sont20 - Pula, single-rail.